Provincial Curia, QUEZON CITY—A new day is breaking for the Augustinian Recollection in Asia as two lionhearted friars leave today, September 18, for their Indonesian mission. In obedience to the prodding of the Prior General to make an ocular visit to the place, Fray Dionisio Selma, OAR, Prior Provincial, together with Fray Edgar Tubio, OAR, Section Head for Mission Apostolate, accompanied the pioneer missionaries in this historic trip to the city of Pontianak, capital of the Indonesian province of West Kalimantan. On board the Cebu Pacific evening flight from Manila, they are expected to arrive towards midnight in Jakarta where they will spend a brief layover and resume early morning of the following day, September 19, their connecting flight via Garuda Airlines en route to Pontianak. After 23 months in the drawing board since the 55th General Chapter held in October 2016 had approved the decision to “expand in a new country in Asia,” a new episode set in and another Life and Mission Project (LAMP) of the Order and of the Province of St. Ezekiel Moreno was “initially” implemented. “Initially” in the sense that the first phase of the progressive implementation of the LAMP has begun. 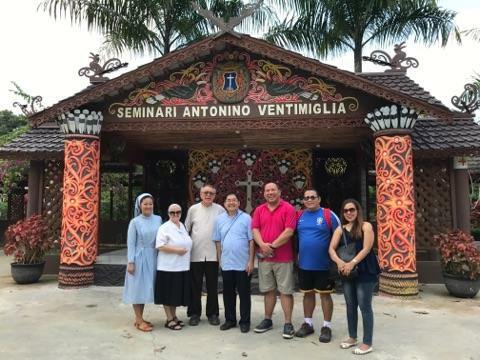 Fray Henry Santiago, OAR (4th from the left) and Fray Edgar Tubio, OAR (3rd from the right) in one of their visits in the Archdiocese of Pontianak. Upon arrival from the General Chapter where he was an a iure delegate, Father Selma convoked a Provincial Council Meeting. In that meeting of November 5, 2016, the 20th for the triennium 2015-18, he echoed to the Council the salient points raised during the General Chapter. He also focused on those “four major decisions” that the Province needed to give priority to. The expansion of the Province to “another Asian country”—which, therefore, excludes China and Taiwan where the OAR is also continuing its missionary presence—was initially discussed. During the brainstorming sessions, four countries emerged as candidates for future consideration: Vietnam, Sri Lanka, India, and Indonesia. The 21st Provincial Council Meeting on December 9, 2016 made a follow-up discussion on the plan to create Recollect communities according to the said LAMP decision. Fray Edgar Tubio, erstwhile President of the Secretariat of Ministerial and Mission Apostolate, picked out Indonesia and Vietnam because of the possible linkage the Province can make through the OAD Filipino priests and the OSA Sisters who are respectively working in these places. During the meeting on January 6, 2017, Fray Tubio made a report about his initial chat with Fr. Jennifer Amamangpang, OAD, a Filipino, whose religious community is stationed in Bandung, Indonesia. After his vacation in the country and before his return to Indonesia, Fr. Amamangpang dropped by the Provincial Curia on January 8, 2017 and met Fray Tubio to make a follow-up on the said plan of the Recoletos to do mission work in Indonesia. On February 16, 2017, the Council tackled two relevant issues. One, about Bandung where Catholics only comprise 1% of the total population; a great majority are Muslims. But the Council preferred another suggested area: Archdiocese of Pontianak. This was relayed in a conversation to Fray Amado Emmanuel Bolilia, a Provincial Councilor, by one of the OSJ (Oblates of St. Joseph) Fathers who were given a parish by the archdiocese. Consequently, the plan to contact the archbishop was approved. Two, the Council tackled the request of the local bishops namely that of the Diocese of Tandag and the Archdiocese of Lingayen-Dagupan. The petitions for Recoletos to work in these territories understood as “local mission areas” were viewed as springboard for future foreign missions such as Indonesia or Vietnam. The Council further saw that whoever would be sent to any of these countries be exposed first to our local mission areas. Additionally, the “Alis-Bayan” Program made available by the Divine Word Institute of Mission Studies in Tagaytay City were so considered that former and visiting OAR missionaries were sent for updating. It also became a benchmark for preparing future missionaries because of the positive feedbacks from participants. The Province of St. Ezekiel initiated the opening of communication lines with the local ordinaries of Pontianak, Sintang, and Ketapang – all of them in the Province of West Kalimantan in the island of Borneo. The responses were encouraging. Archbp. Agustinus Agus, D.D. of Pontianak wrote: “I thank you for the intention of taking part in our ministries.” He suggested “December 2017” as the right time to pay a visit to this place. 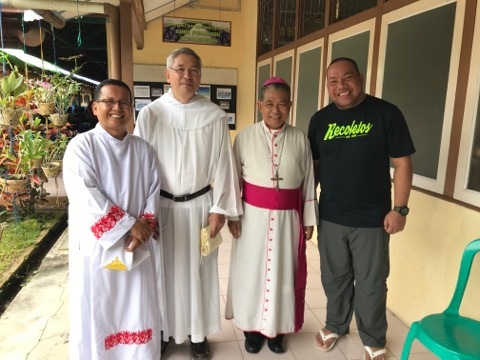 Fray Manuel Lipardo, OAR (2nd from the left) and Fray Tubio visited the Archbishop of the Diocese of Pontianak, Most Rev. Agustinus Agus, DD. Fray Tubio was accompanied by Fray Henry Santiago, Provincial Procurator, during the first ocular visit and courtesy call to the three local ordinaries on October 14-22, 2017. He said in his report to the Provincial Council that the bishops were eager to welcome the Recollects due to dearth of missionaries in their dioceses which are very extensive. Begging to avoid hyperbole, Fray Tubio was saying that, by the time the parish priest finish celebrating masses during Christmas in all the chapels of his parish there, it would already be Lenten Season. Fray Tubio also said that parishes there have a convent, a church, a clinic, and a dormitory. “The dormitory is where the kids from remote areas are housed together to facilitate the program of evangelization and to secure them from possible dangers,” he said. On December 3-19, 2017, the second visit to Indonesia was undertaken by Fray Tubio. This time, Fray Manuel Lipardo, OAR, also a missionary, accompanied him. In his report to the Council, Fray Tubio suggested that, just in case the Province choose Indonesia, the best starting point would be in Pontianak. During the Provincial Council meeting on March 8, 2018, the decision was finalized: it will be in Indonesia first; Vietnam may be considered later. During the drafting of the assignment of the religious, the Council learned that Frays Russell Lapidez and Dominador Mercado Jr. volunteered to work in Indonesia. Fray Lapidez had spent eight years in Sierra Leone, particularly in Kamabai where he was the local prior since the previous triennium while Fray Mercado, on the other hand, had been in Sierra Leone for seven years, and was assigned as the local prior of Kamalo community since the last triennium. “After spending some years in Sierra Leone, I was entertaining the idea of ‘resting’—but it’s ‘resting’ in the sense of giving way to the much younger missionaries. Had the superior told me to stay and continue working there, there would still be no problem with me,” Fray Lapidez recounted. “But since the opportunity to work in another Asian country came, I volunteered,” he continued. Fray Mercado also recalled that when he was told to come back to the Philippines after the triennium, he decided to volunteer instead to work in another would-be mission area. “When I had learned that we will open in another Asian country, that was when I volunteered. That’s why Fray Tubio did not look for other volunteers anymore,” he said. In July this year, Father Provincial formally informed the Prior General about the Council’s decision to proceed with the sending of missionaries to Indonesia. The latter, in his response, was pleased to know that the volunteers are themselves seasoned missionaries. Arrangements with Archbp. Agus as regards the residence and observance of religious life of the friars were finalized. The archbishop himself designated that, as the two need still to go to a language school to learn Bahasa, they will meantime reside at the convent of the religious brothers belonging to the “Kongregasi Hati Maria Tak Bernoda” (or “Congregation of the Immaculate Heart of Mary”) in Pontianak City. It is hoped that when they shall have mastered the language, the friars will form the new Recollect community which will be opened by next year. By then, the third member who shall be from among the ordinandi this coming December, will already be ready to join them to comply with the minimum number of religious in the community. 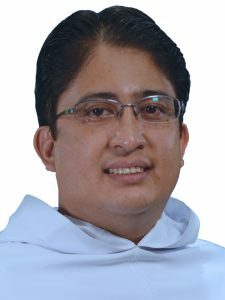 Fray Lapidez was born on June 1, 1977, made his simple profession on April 28, 2001, and was ordained a priest on October 7, 2006. He is from Koronadal City, South Cotabato. 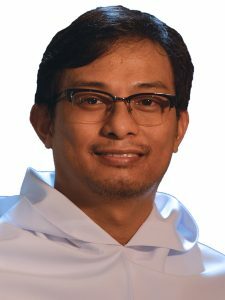 Fray Mercado was born on October 30, 1976, made his simple profession on April 26, 2003 and was ordained a priest on December 5, 2009. He is from Baclayon, Bohol.